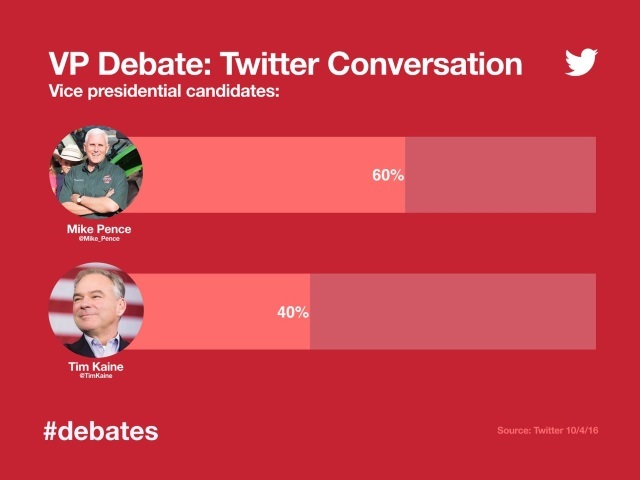 Mike Pence was the subject of 60 percent of conversation on Twitter during Tuesday night’s vice presidential debate, while just 40 percent was about Tim Kaine. Twitter reported that the Republicans’ edge prevailed in discussion about the presidential candidates Tuesday night, with 63 percent about Donald Trump and 37 percent about Hillary Clinton. Pence picked up 22,000 Twitter followers during the debate, while Kaine added 15,000 to his tally. Finally, the most retweeted tweet during the debate came from Trump and congratulated Pence, his running mate. Readers: Did you interact on Twitter during the vice presidential debate Tuesday night?